Delivers 4x4:4SS MU-MIMO capability, Aruba’s advanced ClientMatch and an integrated Bluetooth beacon to enable Aruba location services. The 370 series is as simple to install as an outdoor video camera and features integrated antenna options for easy deployment. 370 series APs – with or without external antennas – are totally unobtrusive and look just like any other common outdoor fixture. 370 series APs have an integrated BLE Beacon to simplify management of a large-scale network of battery-powered Aruba Beacons. See how DreamWorks Animation leverages Aruba outdoor wireless solutions to move to a digital workplace. Supports up to 1,733 Mbps in the 5 GHz band (with 4SS/VHT80 or 2SS/VHT160 clients) and up to 300 Mbps in the 2.4 GHz band (with 2SS/HT40 clients). Minimizes interference from 3G/4G cellular networks, distributed antenna systems, and commercial small cell/femtocell equipment. Supports priority handling and policy enforcement for unified communication apps, including Microsoft Skype for Business with encrypted videoconferencing, voice, chat, and desktop sharing. Integrated AirMatch technology manages the 2.4-GHz and 5-GHz radio bands and actively optimizes the RF environment including channel width, channel selection and transmit power. AppRF technology leverages deep packet inspection to classify and block, prioritize or limit bandwidth for 1,000's of enterprise apps or groups of apps. IP reputation and security services identify, classify, and block malicious files, URL and IPs, providing comprehensive protection against advanced online threats. 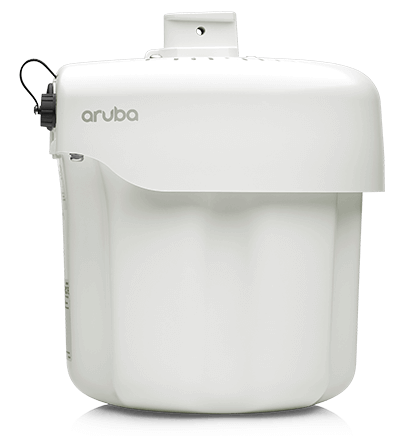 As unified APs, the Aruba 370 Series can be deployed with or without a controller and can be readily switched to accommodate changing network needs. Controllerless (Instant) mode: In Aruba Instant mode, a single AP automatically distributes the network configuration to other Instant APs in the WLAN. Simply power-up one Instant AP, configure it over the air, and plug in the other APs – Instant Network. For large installations across multiple sites, the Aruba Activate service significantly reduces deployment time by automating device provisioning, firmware upgrades, and inventory management. With Aruba Activate, Unified APs are factory-shipped to any site and configure themselves when powered up. Dynamic frequency selection (DFS) maximizes the use of available RF spectrum. Note: conducted transmit power levels exclude antenna gain. Short guard interval for 20-MHz, 40-MHz, 80-MHz and 160-MHz channels. Transmit beam-forming (TxBF) for increased signal reliability and range.